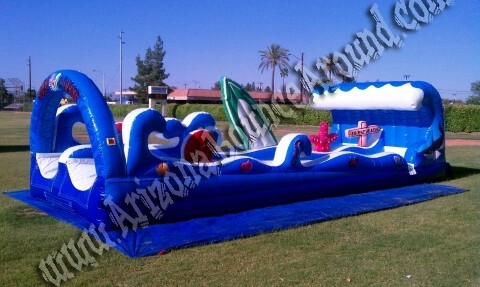 Our Surf the Wave dual lane slip n slide looks amazing and is perfect for kids and adults featuring a beach theme with a inflatable surf board, star fish and beach sign sticking up in the middle. We install a water spray system over the entrance arch that keeps the slip n slide wet during use. If your looking for a giant slip n slide for adults or city events be sure to check out our huge slip n slide that can be configured from 225 to 525 feet long. 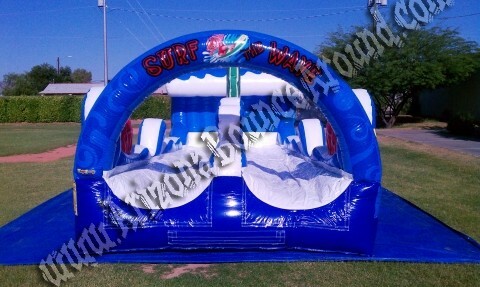 Add a dunk tank or foam machine for even more fun. 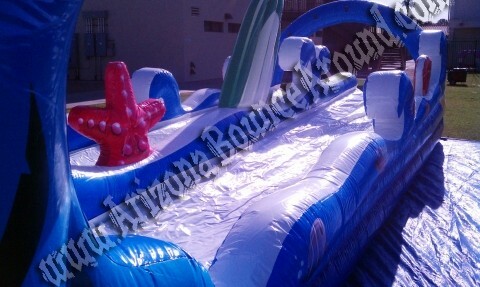 This inflatable duel lane slip & Slide will be a big hit at your party with beautiful artwork and a very slick sliding surface is sure to be a big hit at your summer party. This inflatable duel lane slip & slide game requires a constant water supply from a standard water hose and must be set up on a flat, level surface. Perfect for ages 5 to adult.